1. One that inhales: an avid inhaler of aromatic pipe smoke. 2. A device that produces a vapor to ease breathing or is used to medicate by inhalation, especially a small nasal applicator containing a volatile medicament. Also called inhalator. a device for administering medications to be inhaled, such as vapors, fine powders, or volatile substances. An inhaler also may be designed to administer anesthetic gases. Therapeutics A device that delivers a therapeutic agent. See Metered-dose inhaler, Nicotrol inhaler. An apparatus for administering medicines by inhalation. 1. A device for administering medicines by inhalation. A device used for self-administration of aerosolized drugs. When used correctly, a metered-dose inhaler can deliver accurate doses of medication to the respiratory tract. The MDI is a drug canister in an L-shaped mouthpiece, which can be used alone or with a “spacer” (a holding chamber designed to aerosolize medication so it can reach the lower respiratory tract). 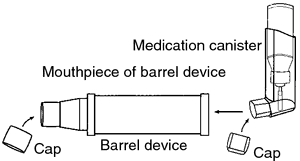 The health care professional teaching the patient proper MDI technique should gather the drug canister and mouthpiece, the package insert, and the spacer (if one is to be used). The MDI should be sprayed once or twice prior to initiating use, and the spacer inspected for foreign objects. The patient should wash his/her hands thoroughly, and may either sit or stand. If a peak flow meter is being used, the patient should take a reading prior to using the MDI. The patient should then clear the throat and nasal passages. The patient should hold the inhaler upright and shake it as directed, then remove the cap and hold the inhaler with the canister on top and the mouthpiece facing the patient's open mouth at the bottom. Tilting the head back slightly, the patient should breathe out slowly and completely. (When using an MDI with a spacer, the inhaler cap is removed and the mouthpiece is firmly inserted into the spacer, then the spacer and inhaler are held together upright and vigorously shaken 5 or 6 times. The space cap is then removed, the head tilted back, and the breath let out slowly and completely.) The inhaler mouthpiece may be positioned in one of two ways: 1 to 2 inches (2.5 to 5 cm) in front of the open mouth, mouth open; or with the mouthpiece in the mouth and lips sealed around it. However, this latter technique is less efficient in delivering medication and should never be used for steroids. While breathing in slowly, evenly, and deeply though the mouth, the patient should press once on the canister and continue inhaling for 3 to 5 sec. The breath should then be held for 10 sec (or as long as possible), allowing the medication to settle in the lungs. The inhaler should be removed from the mouth prior to exhaling. If a spacer is used, the patient should place the spacer mouthpiece in the mouth and seal the lips around it, then press on the canister to spray a puff of medication into the spacer and begin inhaling slowly through the mouth for 3 to 5 sec. The breath should then be held for 10 sec (or as long as possible). The spacer should be removed from the mouth prior to exhaling. If more than one puff is prescribed, the patient should wait 1 to 2 min between puffs to help the second puff to better penetrate the lungs. The patient should be taught to remember “B before C” when using an inhaled bronchodilator and corticosteroid; first inhaling the bronchodilator, waiting about 5 min, and then inhaling the corticosteroid. This helps to open the air passages for maximum absorption of the steroid. After inhaling a corticosteroid, the patient should rinse the mouth with water and expectorate it. The spacer and the L-shaped mouthpiece and cap should be rinsed with warm, running water at least once each day, and washed with warm soapy water, then rinsed at least once each week. The equipment should always be allowed to air-dry. The patient can calculate how long a drug canister will last by reading the total number of doses on the label, counting the number of puffs used each day, and dividing the total doses by the number of daily puffs. (Thus if a canister contains 200 doses and the patient takes 8-10 each day, a new canister will be required in a month). The health care educator should provide the patient with written instructions and illustrations for proper MDI use. The patient also should be taught about (and provided with) information on the desired effects of each medication and the possible adverse reactions. The teaching session, the patient's demonstration of the method, and any questions raised should be documented in the patient's record. 1. Synonym(s): respirator (2) . 2. An apparatus for administering pharmacologically active agents by inhalation. nasal inhaler. 2. a device that is placed over the nose to permit inhalation of anesthetic agents. an apparatus for administering vaporized or volatilized agents by inhalation, or for protecting the lungs from harmful substances in the air. The consequences of not being able to physically operate an inhaler can be severe for patients as badly treated asthma can be fatal. However, the authors note that heterogeneity between the studies used in the analysis was high, and suggest that future investigations should look to use a more standardized approach in assessment of inhaler device errors. Rob Koremans, president and CEO of Global Specialty Medicines at Teva, commented: "This important launch marks not only the first available generic ICS/LABA product in the US, but also the continued expansion of our RespiClick family of products, which now includes breath-activated inhaler options for both maintenance treatment and rescue medication. We used an inverse distance-weighting (IDW) algorithm to estimate pollutant concentrations for locations of rescue inhaler use per hour or per day using the AQS monitoring data (Figure 1). Patients diagnosed with obstructive broncho-pulmonary diseases and using inhaler therapy were included. 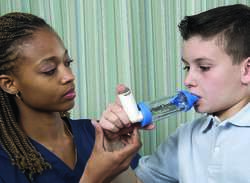 Increase in the prevalence of asthma, COPD and other respiratory disorders, especially among paediatric and the geriatric population, is a major factor driving growth of the global respiratory inhaler devices market. A spokeswoman for the BLF said: "With so many different inhalers available and administered through GP surgeries it can be difficult for people to remember the best way to take the medication they have been given. A new study had found that only one in 10 can use an inhaler properly. Very occasionally a child might forget their inhaler, and every effort should be made to rectify this, and as a last resort the spare inhaler could be used in an emergency. HEALTH officials have been urged to speed up a consultation to allow spare inhalers in schools - a move which could prevent children dying from asthma attacks. WASHINGTON -- The Food and Drug Administration vows to complete its phase-out of all inhaler medical products containing chlorofluorocarbons (CFCs) by the end of the year as part of an effort to comply with an international treaty to protect the ozone layer by eliminating the worldwide production of numerous substances, including CFCs, which have been found to contribute to ozone depletion. Summary: My child is taking inhalers daily as per the doctor's advice since few months but still has attacks which need the reliever inhaler and nebulisation.